California has embarked on a major new wave of curriculum reform with the adoption of the Common Core State Standards (CCSS), the new English Language Development (ELD) standards, and the Next Generation Science Standards (NGSS). The adoption of the CCSS builds a legacy of standards-based education reform in California that began with the development of curriculum frameworks in the 1980s and continued with the adoption of the California State Standards and the approval of the Public School Accountability Act. The environment for implementation of the CCSS has improved dramatically since the new standards were adopted in 2010. The state education budget is growing rather shrinking. The state has reiterated its commitment to CCSS and expanded the scope of the statewide pilot of the new Smarter Balanced (SBAC) assessments, and provided earmarked funding to support CCSS implementation. Work on new curriculum frameworks is nearing completion, which means that districts will soon have a list of state endorsed instructional materials to choose from. Each of these changes present new opportunities and challenges for districts as they design and implement a plan for CCSS. 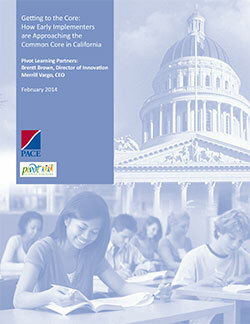 The report is intended to inform both practitioners and policy makers about the wide variety of CCSS implementation strategies that California school districts are choosing. The report does not aim to evaluate these strategies, or paint a picture of how the average school district in California is responding to the challenge of CCSS implementation. Instead it offers an in-depth look at a small group of early implementers of CCSS, with the goal of chronicling the choices these pathfinders have made, identifying lessons they believe they have learned, and mapping potential pitfalls that other districts may seek to avoid.